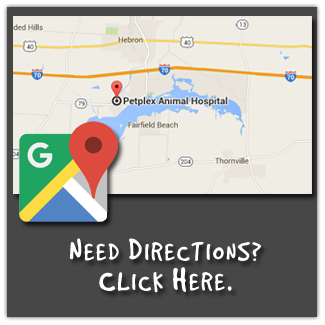 Petplex Animal Hospital, the Right Vet for your Pet. Preventive care is necessary to keep your pet healthy. Petplex Animal Hospital offers Wellness Care, routine Physical Exams, Dentistry and dental X-ray, Surgery, in house blood machines, Digital Radiography, CT Imaging, and Vaccinations to assist you in maintaining your pet in the best health possible. To assist in keeping your pet healthy, happy, and smelling nice we offer Grooming, Boarding, and Microchipping. Please call for more details. Petplex Animal Hospital understands that your pet is a special member of your family that provides companionship, entertainment, and unconditional love, and your pet relies on you for food, shelter, and to take care of them when something is wrong. Our expert emergency Veterinarians and Certified Technicians will be there for you when you need them. Help is only a phone call away! Keep our phone number with your other emergency numbers 740-929-3300. Please note that we only see emergencies on Sundays and that we are typically available until 11:30 pm most nights for emergencies.